You may remember this Mangalitsa Post back from the spring of 2010. Well this little piggy just continues to grow in popularity! Being Hungarian, this particular swine has a little special place in my stomach and on my palate. The Mangalitsa is native to Hungary where you will see these large curly haired pigs standing in corrals and yards all over the countryside. I am lucky to have eaten my share on Hungarian soil on two separate occasions. Naturally, this pig is not getting the press in Hungary as it has gotten here since it is so common and local. The Mangalitsa being harder and definitely more expensive to find in the US brings us to my trip to NYC in mid January. 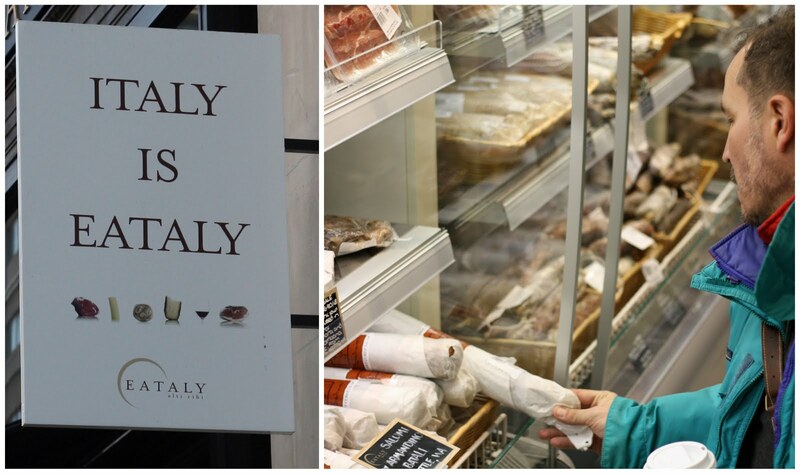 Eataly, the Italian/European super store and brainchild of Mario Batali, is a food lovers paradise - it was one of the first stops on my list. Mangalitsa can be found for *cough* $36.80 a pound. We did taste and purchase enough to stow away for a tapas lunch we were having with some friends over at Postling. Needless to say no one had any issues with me pulling this out of the bag to accompany the appetizers! Even Andrew Zimmern from Bizarre Foods is getting in on the act. You can catch the Hungarian episode on March 29th at 8:00 on the Travel Channel. Below is a sneak peak on the star pig! One thing for certain is - the only raw pork E.A.T. would consume would have come from his Hungarian grandmother! What an amazing store that must be! I don't know if it was there when I last went to NY, but I hate to think that I missed it if it was there. You really should hit it up. Not to be missed on your next trip! Loved the Andrew Zimmern clip - and am gratified to know that Hungarians prize fat, for whatever reason!!! My English and Hungarian DNA would probably be at war over eating the raw pork. One more food to add to my list of must tries; I am all for Hungary anything, since I love Hungarian artists.